I ordered this bad boy exactly a month ago from Amazon on a whim. It was through the Amazon Marketplace from a seller in Japan, so this purchase did not come with tracking, just a delivery window of April 20 - May 7. I then kinda forgot about it, but it finally came! Whoo! 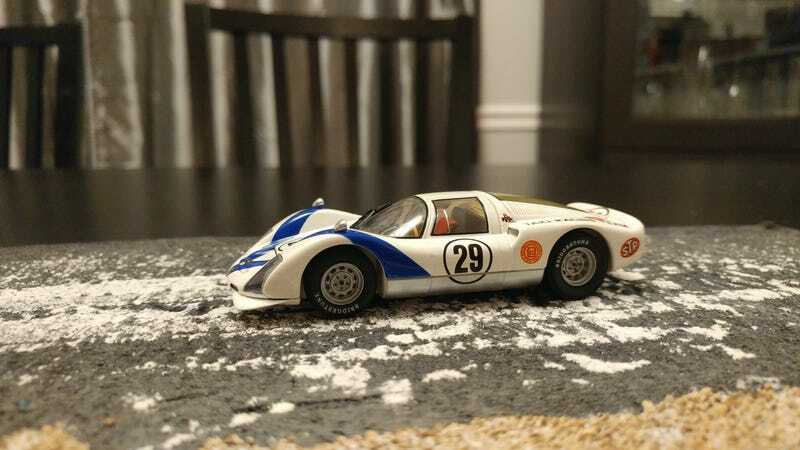 As the title gives away, this is a Porsche 906. In good Porsche tradition, the 906 was basically an evolution of the 904, after Ferdinand Piech took over the experimental department and turned it into a race development department. The heavy frame of the 904, along with the desire for a 6- and 8-cylinder racer turned the 904/6 into the 906. It got an aluminum space frame chassis to replace the 904's steel ladder frame, a 210 hp 1991cc carburatted 6-cylinder engine, and wheels and suspension parts from the Lotus F1 team, all adding up to a super light, tiny, gullwinged racer that scored a class victory and P6 overall in its debut at the January 1966 Daytona 24H. As son as the 50 units necessary for homologation were done, work started on an 8-cylinder version, as well as a fuel injected one. This 906E (for einspritzung) finished P4-6 behind three Ford GTs at the 1966 Le Mans 24H. Unfortunately the four 8-cylinder cars (906/8) didn’t do too well, but the rest of the 906 lineup turned out to be a huge success. This specific car (chassis 120), the Taki Racing Team #29, was first driven to a DNF at the 1966 GP of Japan by mr. Shintarou Taki himself, but did manage two wins, a P2, and P3 during the rest of 1966, and five more wins in 1967. 1968 was another successful year, with four wins and a P2, plus the P7 at the GP of Japan that year, which is the version you see before you. I don’t know why Ebbro decided to produce the car with the year’s worst result for the car (outside of two DNFs), but I still like it. I can’t seem to find any images of the car in this exact livery, sadly, so you guys will just have to enjoy the photos of the model I took.